GS Custom Bullets, a company based in South Africa, has provided samples of their 6.8mm/.277” 80gr and 99gr HV bullets for load development and terminal performance testing in the 6.8 SPC. You don’t seem to hear much about these bullets so I don’t know how familiar some of the HuntingNuts are with them. 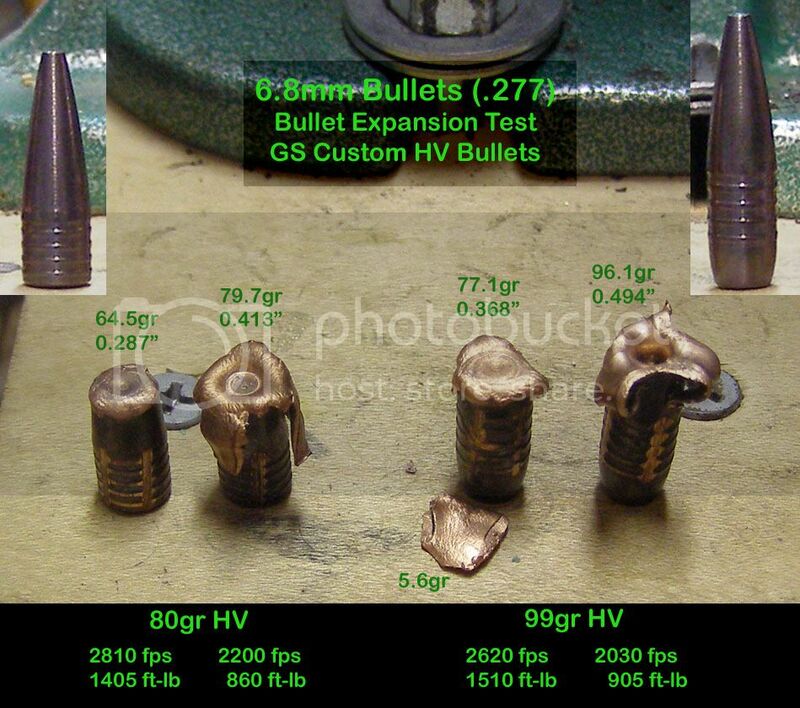 GS Custom HV are monolithic, all-copper hunting bullets for all calibers. The 80gr and 99gr HVs are compatible with the 6.8mm and can be loaded within AR magazine length. The 99 HV was designed specifically for the 6.8. These GSC bullets are manufactured in America and are unique in that their bore diameter is undersize with multiple “drive bands” as gas seals. This provides a bullet with less internal friction that can be driven to higher than typical velocities using faster powders. CAD images of the 80gr and 99gr HVs are shown below to illustrate the five drive bands and hollow-point expansion cavity. The first drive band is the back part of the ogive. More details about their bullet design and how they work can be obtained from the GS Custom website. GSC has 110gr and heavier 6.8mm/.277” bullets that could work in at 6.8mm bolt guns or .270 Win with 1:10 or faster twist. The website goes beyond just using their bullets and is a wealth of knowledge with respect to reloading and hunting. What follows are the results of my experience conducting load development, hunting, and terminal performance testing. This information is shared with other forum members to share knowledge and help those who may choose to use these unique bullets to be up and running as quickly and efficiently as possible. 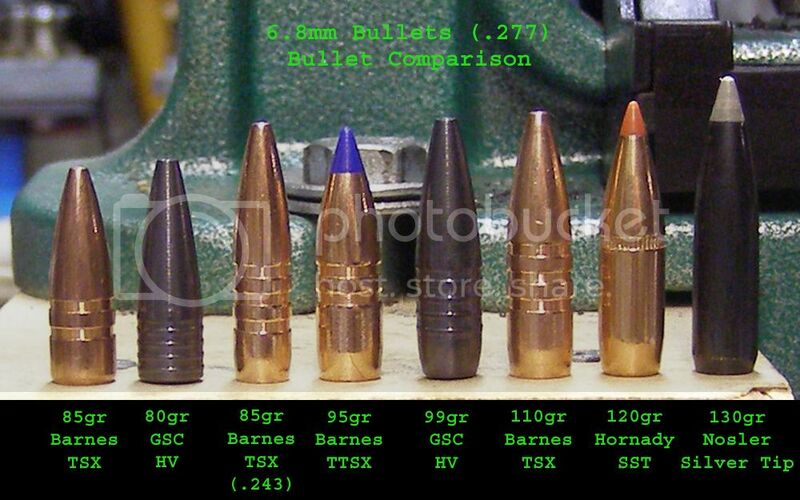 Above is a picture of the GS Custom 80gr and 99gr HV bullets in a line-up with other popular .277” bullets. I was testing .243 Winchester 80, 85, and 100gr bullets at the same time so also included a .243 Barnes 85gr TSX for comparison. Note, the HVs are coated with a proprietary tri-metal lubricant which does not contain moly. The 130gr Nosler Silver Tip on the far right also is a Nosler BT coated with a black, non-moly lubricant Nosler calls Lubalox. These coatings are designed to reduce friction, minimize fouling, and extend barrel life. Up front, you need to know that these lathe-turned projectiles are costly - current prices (2014) per 50 are $57 for the 80gr HV and $66 for the 99gr HV plus shipping (link below). Do not let this cost stop you from reading further. When I look at how many medium- and large-game hunting bullets I consume per year and then all the other associated costs when I go hunting, (e.g., rifle, scope, lodging, mileage, fuel, hunting license, etc.) the extra 30 or so dollars for these bullets is really not significant in the bigger picture. So why spend this much for a dedicated hunting bullet like these. Two words – Precision and Performance. Precision – 18 of 20 the 80gr HVs weight in exactly at 80.0 grains. The other two waffled between 80.0 and 80.1. After weighing five 99gr HVs, all at 99.0 grains, I didn’t go any further. This rivals or exceeds the weight variation of match grade bullets I have used. Performance - muzzle velocities from an 18” 6.8mm SPC II barrel can match that of a .243 Win with a 22” barrel for the same bullet weights. Velocity data using five powders is presented in the Powder vs Velocity section. With the ogive flush with the case neck, the 99 HV has a 2.28” COAL. The 80 HV has a longer nose, but the bullet still looks acceptable when loaded to 2.30” COAL. Note the 80 HV design is new as of December 2013 and has a longer ogive than previous. With these drive-band bullets, varying COAL does not affect velocity or pressure. I verified this with three 99 HVs loaded at different COALs. 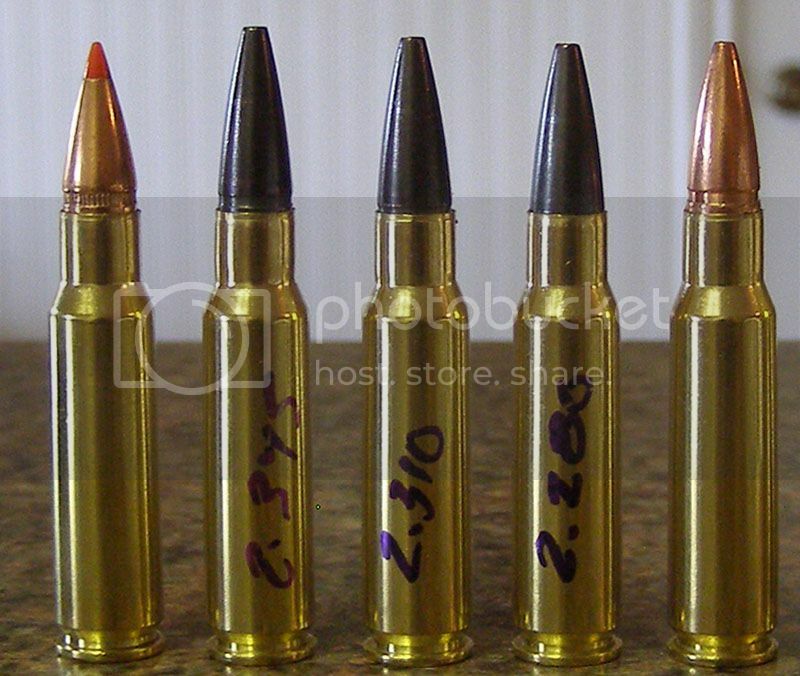 With 31.0 grains of AA2200, e.g., 2.255”, 2.300”, and 2.345”, the velocities were 2886, 2886, and 2879 fps, respectively. Case head expansion measurements showed that chamber pressures did not vary with COAL changes which is also supported by the consistent velocities. To start this evaluation, both bullets were seated with the second drive band just inside the neck resulting in a 2.370” and 2.345” COAL for the 80 HV and 99 HV, respectively. This seating depth let me use a collet bullet puller on unfired rounds judged to have too much pressure during the powder charge vs velocity ladder process. For AR shooters, a simple mod to just the front of the 6.8 magazine will accommodate these rounds for hunting situations. My magazines and AR rifle have been modified to shoot with COALs greater than 2.300”. I now load long with most 6.8 hunting bullets because I have been achieving better accuracy with bullets seated closer to the lands. Examples of the 99gr HV with varying seating depths are shown below sandwiched between 120gr SST and 85gr TSX loaded to 2.295”. With these bullets, you adjust COAL to tune for accuracy not powder charge. Thus, you develop your speed first and then adjust COAL for accuracy. GSC recommends finding your max velocity/pressure then loading 50 to 100 fps below that to develop your accuracy load. This gives a safety margin for changes in temperature, altitude, dirty barrel, etc.. Group size is tuned by changing COAL in 0.020” increments. Magnum primers must be used with these bullets. Remember they perform better with faster than typical powders. It is essential to make sure the inside of your case neck has a good chamfer so the drive bands don’t get shaved down when seating into the case. If the drive bands do become damaged, you will experience velocity variations and degraded accuracy. In my rifle, I found it was easy to go beyond max chamber pressure with the 99 HV and not have clear signs of pressure on the primers and swipes on the brass. I have an adjustable gas block which is a consideration as swipes are reduced when the gas is adjusted down. In an overpressure situation, what I found with the 99 HV was the felt recoil increased and the action started to short stroke. The chamber pressure was enough to actually hold the case against the chamber wall, delaying extraction until pressure had decreased (thank you constructor for the analysis). This situation caused me to pause and find a more reliable way to determine chamber pressure than just primers craters and swipes. I accomplished this by measuring case head expansion (CHExp) using new SSA brass and comparing to CHExp for known SPC I loads. Since I wanted to develop for a SPC II chamber, I allowed for 5% more CHExp before judging a load to be too hot. For reference, new brass has slightly more pressure than resized brass. Hornady brass creates more pressure than SAA. Additional details of this procedure can be found in the following link. There isn’t much 6.8mm load data available for these two bullets. GSC provides some load data for the 80 HV (link below). They do have load data for other calibers. 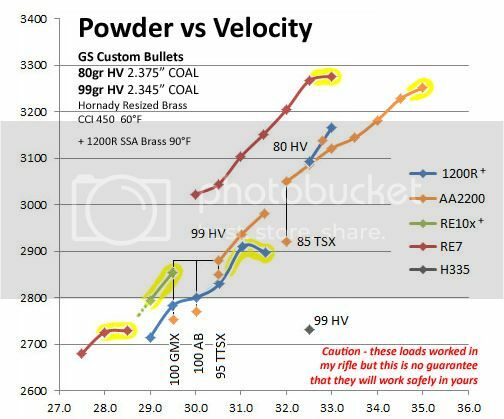 I initially concentrated on powder charge vs velocity ladders with different powders to determine performance potential of these HV bullets in the 6.8mm SPC II chamber then did load development for accuracy with the few bullets I had left. Five powders were used; AA2200, 1200R, Re7, Re10x, and H335. Velocity results are graphed below. All shots came from an 18” ARP 1:11.25 twist. Both resized Hornady and new SSA brass were used with 450 CCI primers. Air temperatures ranged from 60 to 95F over the different range sessions. I looked for cratered primers and swipes as pressure indicators and double checked chamber pressure by measuring CHExp with new SAA brass. Even with limited load data, it’s relatively easy to work up loads for these bullets with the powder you have on hand. Take your favorite 85 TSX/90 HP or 95 TTSX/100 AB load and use that as a starting point for the 80 HV and 99 HV, respectively. Work up from there in 0.5 grain increments with a powder charge vs velocity ladder to determine the max velocity for your rifle within your comfort zone for chamber pressure. Then you can work around this area to find an accuracy node (see accuracy section below). This is what I did starting with AA2200. 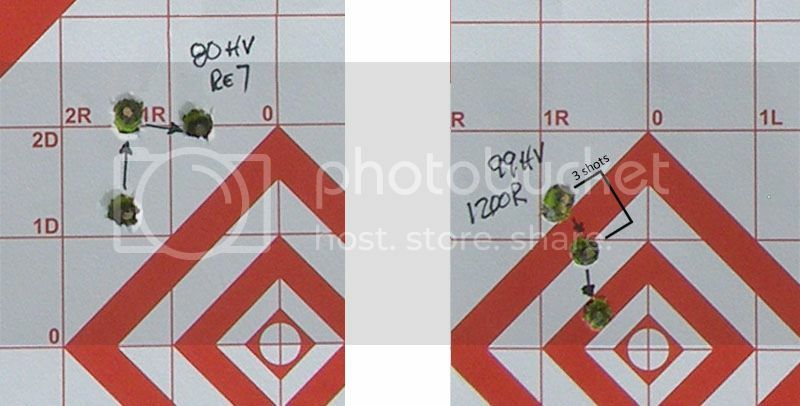 As examples, with 30.5 grains of AA2200, which is slightly above the manufacturer’s recommended 30.2gr max for the 95 TTSX, the 99 HV shot 30 fps faster with resized Hornady brass and 50 fps slower in new SSA brass (so basically the same velocity). However, while the 95 TTSX was at its maximum chamber pressure, the 99 HV can still take additional powder before reaching its max chamber pressure. The 100 AccuBond with 30.0 grains of AA2200 is over max (especially for a 90F day) with a 2770 fps muzzle velocity. Also shown is the new 100 GMX with 29.5 grains of AA2200. The 99 HV can take another 1.5+ grains of powder than both these 100 grain bullets and still be at a lower chamber pressure with 200+ fps more velocity. This shows the performance advantage of the GS Custom bullets. Of the powders tested, Reloader 7 had the most velocity potential with the 80 HV. AA2200 had the most with the 99 HV. The single velocity point for H335 was significantly below expectation and its use was abandon to conserve bullets. A word of caution, 1200R looked to be the most accurate powder with these bullets but I’ve seen chamber pressure and velocities become erratic if a reloader gets too hot with this powder. A 1200R load that was fine at 60 or 80F turned South at 90F. You can see that in the graph. I’ve had 1200R do this with other bullets also. 1. Do not assume what worked in my rifle will work safely in yours. Start low and work up. 2. Portions of the velocity curves shaded in yellow were assessed to be above max chamber pressure for the SPC II. They were too hot for me though I know some 6.8 shooters operate with this high a chamber pressure. I do not recommend that you do. 3. If a velocity string has no yellow behind it I stopped at the max. Do not load a higher charge. 4. An adjustable gas block was used. The lower gas bleed off has resulted in as much as a 50 fps increase in muzzle velocity compared to a fully open gas port. 5. The 99gr HV took a larger gas block opening to cycle the action than the 80gr HV. Below is trajectory data for consideration. The zero for the 99gr HV was 0.4” high at 100 yards (table on the right). This was done to support use of a mil-dot reticle for bullet drop compensation with the first dot being 300 yards and 2nd dot on at 400 yards while still providing a pretty flat trajectory out to 200 yards. The 80gr HV with a 200-yard zero has a trajectory close to that of a laser beam. Note that the 80gr HV trajectory matched nicely with the first mil-dot being on at 350 yards and the second dot being on at 450 yards. On impact, these bullets expand with 3 pedals. Above 2600 fps, the pedals are designed to break off allowing a flat-nose slug to penetrate. GS Custom has determined that flat-faced slugs create larger wound channels than a rounded mushroomed bullet. At slower speeds, the three pedals are retained and wrap down the sides of the bullet leaving a slightly larger frontal area. Minimum expansion velocity is designed to be 1600 fps. You can see the comparison below of recovered bullets. I did not do a standard 100 – 200 – 300 yard terminal performance test series. Instead, tests were done above and below 2600 fps impact velocities to see how the bullets performed with and without their pedals. The slower speed bullets (pedals retained) were fired from a .270 Win with Trail Boss. I had hoped for these would have been slower impact speeds but these drive-band bullets were 200 fps faster than my Trail Boss loads for other 6.8mm bullets. With their pedals shed, these bullets penetrate deep which should make the 99 HV suitable for larger game. I approached accuracy development in two stages. The first effort was to quickly get a load for a hunting trip. The second effort will be to fine turn group size using GSC’s recommended procedures by changing COAL in 0.20” increments. With regard to quickly putting together an accurate load for hunting, it was easy to achieve 1 MOA on the first try. In fact, a couple of the powders would group 3 shots from a powder charge vs velocity ladder within 1 inch at 100 yards. Two examples are shown below, e.g., 31.5 –> 32.0 –> 32.5 grains of Re7 with the 80 HV; and 29.0 -> 29.5 -> 30.0 grains of 1200R with the 99 HV. These two powders appeared to have the best accuracy potential in my rifle based on the powder charge vs velocity ladders. The ladders with AA2200’s had the most spread. Even still, the 80 HV with 32.5 and 33.0 grains of AA220 impacted right next to each other in the powder ladder so I loaded up several rounds with 32.8 grains of AA2200. The subsequent 3-shot group was 1¼ MOA at 200 yards with a variable crosswind of 10 mph with all the dispersion in the horizontal. This isn’t following GS Custom’s recommendation to vary COAL to fine-tune group size. However, this was sufficient accuracy for an upcoming hunting trip so I pressed with this recipe. I consumed most of the sample bullets doing load development and hunting so will have to report on the HVs’ bullets full accuracy potential when my I have a new supply and sufficient numbers. I was fortunate to harvest a medium size pig, around 100 pounds, with the GSC HV bullets. It was a 150-yard shot at night in the sitting position using an LED spot-light. The 80 HV was in the chamber when the hammer dropped with the pig quartering away slightly. When all the dust settled from under the feeder as the sounder scurrying away, the pig was down 5 yards from where it was hit but still alive. A 99 HV to the neck was final. The 80 HV was a pass-through but had hit farther back on the body than desired (my bad). The bullet’s wound channel must have affected the spine which immobilized the pig. I only took the hams off the pig so did not view any internal trauma from the 80 HV (there is plenty of that on the GSC website). The 99 HV to the neck ended up going directly through the spine. At this close range and impact velocity, the 99 HV would have lost its 3 petals and penetrate as a flat-faced slug. What was impressive was the small diameter slug left a much larger diameter wound channel that was wide enough to easily slide my index finger through including the hole left in the spine. One hog down is not conclusive, but I felt the HV hunting effectiveness was positive. Especially when contrasted with two smaller pigs, about 30 to 40 pounds each, I shot earlier that day at the same feeder with Federal 90gr Gold Dots. Each pig had two shots to the body and still ran 75 and 150 yards before expiring. Unlike the HV’s flat-faced slug, the 90 GD expands into a smooth rounded mushroom. Other hunters have reported limited effectiveness hunting hogs with the 90 GDs. This experience is causing me to rethink my opinion regarding bullet expansion and tends to support what GS Custom claims - high-speed, flat-faced slugs make effective wound cavities. Based on the experience I have had and comparison with other bullets I have tested, I wouldn’t hesitate to use GS Custom’s bullets. I have purchased some for my own for hunting this fall including heavier ones to use in my .270. Oops, I sound like a salesman which I am not – just a HuntingNut. Anyway, if you decide to try these unique bullets, make sure you reference their website for additional information as I did not cover every aspect in this write-up. If you are using GS Cusom bullets please post your experiences. I thank GS Custom for the opportunity to experience their bullets. I will post load development for accuracy later next month. It's also my opinion that Gerard usually knows what he's talking about, but that remark about primers makes me wonder why. Did he give you a reason why magnum primers would perform better than standard primers? I'm not convinced. In my .22 Hornet Anschutz it was the opposit. In the Encore I'm beginning to get faith in a Winchester small pistol magnum primer, but the Encore acts almost as a pistol. And no, I'm still not doing the monolithics in my hornets. They are a little too expensive to shoot a rabbit, a dove or a fox and here the .22 Hornet is legally not allowed for roedeer, not enough energy they say. I think GS-bullets are manufactured on a CNC-lathe and it's my opinion also that such a method produces bullets that are far more accurate than the ones produced on a press. Aloys, I thought the magnum primers were beneficial in getting the powder burnt quickly before the bullet gets too far down the barrel since these HV bullets has so much less internal friction than a typical bullet. Magnum primers are also a benefit in colder weather to ensure there is still a hot enough spark to combust all the powder. SJ, I'm still not convinced. In my opinion it's the combination powder/bullet/barrel with a primer that gives you a repeatable ignition that is followed by the pressure peak at the right moment, so that it results in the most stable velocity. And I'm not convinced that a magnum primer will always give me the best results. Why is a match-primer less hot than a magnum-primer? For me a magnum primer in a rifle: rule of the tumb: powder with a burning rate slower than N160 needs a magnum primer, but only the practical shooting will bring the decission. Seems with GSC bullets, Gerald thinks that involves magnum primers. They worked for me. Now I am wondering if the CCI 250 mag primer are indeed hotter... or is it just a thinker primer casing? Accuracy is something that is hard to find!